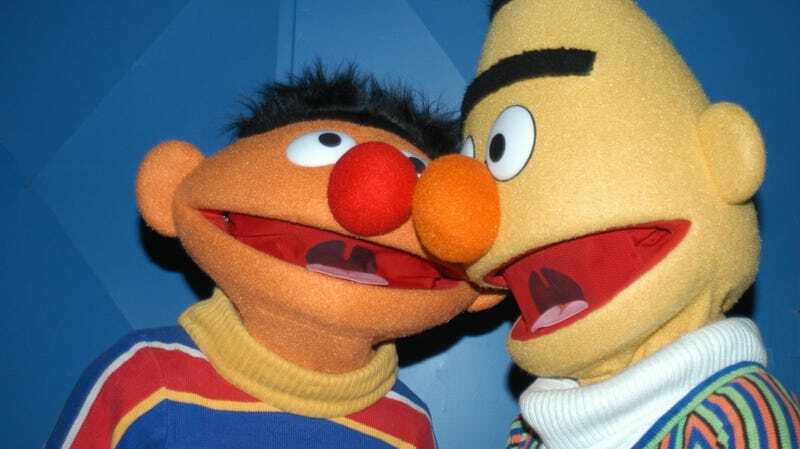 Sesame Workshop can say Bert and Ernie’s bath time adventures are platonic until they’re orange in the face, but even Sesame Street’s writers know the truth. Now, having been inundated with rampant speculation and more fan fiction than you can cram into Elmo’s bus, the suits behind the long-running kid’s program have stopped fighting. Well, if you want them to be. So, no, it’s not an actual confirmation, and one shouldn’t expect to see the pair holding hands in any future episodes. It is, however, better than their previous claims that “they remain puppets, and do not have a sexual orientation,” a stance that likely changed once they learned about furries and Venom-fuckers. The bombshell dropped in a new retrospective, “50 Years of Sunny Days on ‘Sesame Street’: Behind the Scenes of TV’s Most Influential Show Ever,” that digs deep into the show’s birth, legacy, and evolution. Per the piece, the show’s 50th birthday also brings with it a new TV special, a 10-city road trip, and, as we previously reported, a new movie that’s said to star Anne Hathaway. That’s a lot to chew on, as is the discovery made by the below tweet. Trouble in paradise?